Alone they may not seem like much, but as jellyfish band together, their populations are exploding in parts of the world, causing damage that can cost hundreds of millions of dollars to repair. In one reported incident, they capsized a fishing trawler and, in others, caused near meltdowns at nuclear power plants. The growing phenomenon is being studied by PhD student Lucas Brotz with the Sea Around Us project at the University of British Columbia‘s Fisheries Centre. “In some places, it’s clogging fishing nets and damaging fishing gear. In other places, jellyfish are clogging the intake pipes of cooling power plants,” he tells Rick Cluff on CBC Radio’s The Early Edition. Jellyfish are blooming more often in some places, he says. In others, they’re blooming earlier, more intensely, and sticking around for longer. “As we see more and more [jellyfish], and we watch them thrive in some areas where they typically weren’t thriving, I think it may be a signal that our oceans could be stressed or unhealthy,” says Brotz. 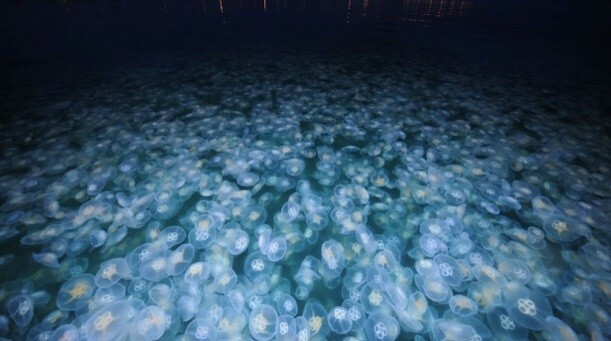 The public can report jellyfish blooms through the website JellyWatch.org, or through their apps for iPhone or Android. “That will really help marine scientists get a better handle on where jellyfish are, how often they bloom because doing oceanic research can be very expensive,” says Brotz. Jellyfish population trends. Red indicates an increase with a high degree of certainty, while orange indicates an increase with a low degree of certainty. Blue indicates a decrease. Green represents a stable or variable population. Grey indicates no data.